Figure 2-16. The Leloir pathway in lactic acid bacteria. surface and has substrate-binding activity. The energy released from ATP hydrolysis drives transport. In general, ABC systems are used to transport amino acids, peptides, and osmopro-tectants. However, several ABC systems are involved in sugar transport, including the maltose ABC systems in L. plantarum and the oligosaccharide-multiple sugar transport system in L. acidophilus. As noted above, regulation of sugar metabolism in lactic acid bacteria is intimately connected to the transport machinery. In L. lactis, for example, lactose fermentation is regulated biochemically and genetically at the level of transcription through a signal transduction cascade mediated via the lactose transport system. Biochemical regulation occurs in two major ways. First, several glycolytic enzymes are allosteric, and their activities are subject to the intracellular concentration of specific glycolytic metabolites.When lactose is plentiful, the high intracellular concentration of fructose-1,6-diphosphate (and low level of inorganic phosphate) activates pyruvate kinase, the enzyme that catalyzes substrate level phosphorylation and ATP synthesis, and the NADH-dependent lactate dehydrogenase, which oxidizes NADH+. In contrast, when lactose is limiting, pyruvate kinase activity decreases, causing a metabolic bottleneck in glycolysis. This cessation of glycolysis results in the accumulation of PEP, which primes the cell for PTS-mediated transport when sugars ultimately become available. A second biochemical mechanism for regulating lactose metabolism involves the PTS transport proteins, and the cytoplasmic component HPr, in particular (Figure 2-12). As outlined above, the PTS cascade starts when HPr is phosphorylated by Enzyme I. Ordinarily, phos-phorylation occurs at the histidine-15 [His-15] residue of HPr. However, an ATP-dependent HPr kinase can also phosphorylate HPr, but at a serine residue [Ser-46]. When HPr is in the latter phosphorylation state (i.e., HPr [Ser-46-P]), phosphorylation at the His-15 site does not occur and the PTS cannot function. At the same time, HPr [Ser-46-P] can bind directly to the interior side of other sugar permeases and prevent transport of those sugars, a process known as inducer exclusion. It is interesting to note that HPr kinase is activated by fructose-1,6-diphosphate, which reaches high concentrations only when the substrate is plentiful. That is, HPr is evidently converted to HPr [Ser-46-P] at just the time when one would expect Hpr to be in a non-phosphorylated state (i.e., in the active transport mode). Thus, it seems counterintuitive that the cells would slow down transport when substrates are so readily available. Why, one might ask, would the cell down-regulate the activity of the transport system in times of plenty? One possible answer is that the cell is simply modulating or controlling its appetite by not transporting more substrate than it can reasonably consume.This hypothesis is supported by the observation that HPr not only exerts biochemical control on transport, but that HPr [Ser-46-P] also regulates transcription of sugar transport genes (Figure 212, Panel B). Specifically, HPr [Ser-46-P] interacts with a DNA-binding, trans-acting protein called CcpA (Catabolite control protein A).The HPr [Ser-46-P]-CcpA complex (along with fruc-tose-1,6-diphosphate), binds to 14 base pair DNA regions called Catabolite Responsive Elements (CRE). These CRE sites are located just upstream of the transcription start sites of certain catabolic genes. When these CRE regions are occupied by the HPr [Ser-46-P]-CcpA complex, transcription by RNA polymerase is effectively blocked or reduced and mRNA is not made. This process, whereby transcription of catabolic genes, including other PTS genes, is blocked in the presence of a preferred sugar, is called catabolite repression. 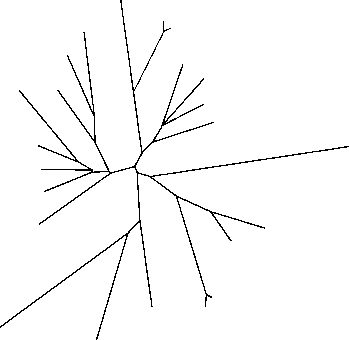 gene (Figure 2-14). When lactose is present, lacR expression is itself repressed, and transcription of the lac operon is induced. However, when lactose is unavailable or when cells are grown on glucose, LacR is expressed and transcription of the lac genes is repressed.Although a CRE site is also located near the transcrip-tional start site of the lac operon, suggesting that the lac genes are subject to CcpA-mediated repression, it seems that LacR may have primary responsibility for regulating sugar metabolism. Metabolism of carbohydrates by S. cerevisiae and related yeasts is, in general, not dramatically different from the lactic acid bacteria. These yeasts are facultative anaerobes that are able to use a wide range of carbohydrates. In S. cere-visiae, as in the homofermentative lactic acid bacteria, fermentable sugars are metabolized via the glycolytic pathway to pyruvate, yielding two moles of ATP per hexose. However, S. cerevisiae, rather than making lactic acid, instead decarboxylates the pyruvate to form acetalde-hyde, which is then reduced to ethanol. Thus, the end-products of sugar fermentation by S. cerevisiae are ethanol and CO2. Furthermore, whereas most lactic acid bacteria are obligate fermentors and have limited means for respiratory metabolism, S. cerevisiae has an intact citric acid cycle and a functional electron transport system and can readily grow and respire under aerobic conditions. Glucose transport is the rate-limiting step in glycolysis by S. cerevisiae. Remarkably, S. cere-visiae has as many as seventeen functional glucose transporters (referred to as hexose transporters or Hxt proteins). Equally surprising, perhaps, is the fact that glucose transport by these hexose transport systems occurs by facilitated diffusion. These are energy-independent systems, driven entirely by the concentration gradient. Some of these transporters are constitutive or inducible, some have low affinity or high affinity for their substrates, and others function not as transporters, per se, but rather as molecular sensors (see below). Thus, the seemingly excessive redundancy inferred by such a large number of transporters instead provides these organisms with the versatility necessary to grow in environments with a wide range of glucose concentrations. This metabolic flexibility has practical significance. During beer or wine fermentations, for example, the initial fermentable carbohydrate concentration is high, but then decreases substantially as the fermentation proceeds. Having transport systems that can function at high, low, and in-between substrate concentrations is essential for Saccharomyces to ferment all of the substrate. Complete fermentation of sugars ensures that these products can reach full attenuation or dryness, qualities important in beer and wine manufacture. Regulation of sugar metabolism in S. cere-visiae is similar, in principle, to that in lactic acid bacteria, but dramatically different with regard to the actual mechanisms and the extent to which other catabolic pathways are affected. In general, catabolite repression occurs when two or more fermentable sugars are present in the medium and the cell must decide the order in which these sugars are to be fermented. Since glucose is usually the preferred sugar, genes that encode for metabolism of other sugars are subject to catabolite repression. In lactic acid bacteria, catabolite repression is mediated via the phosphorylation state of HPr, in concert with CcpA (see above). Repression of catabolic genes for other sugars occurs at cre sites located near promoter regions. In S. cerevisiae, catabolite repression (more frequently referred to as glucose repression) assumes a much broader function. Glucose not only represses transcription of genes for sugar use, but also turns off genes coding for pathways involved in the citric acid cycle, the glyoxylate cycle, mitochondrial oxidation, and glycerol utilization. How does glucose mediate this global response in S. cerevisiae? Although the answer is not fully established, it appears that glucose generates a specific signal that is transmitted via protein cascades and that ultimately results in protein-promoter interactions. Several such cascades actually exist, accounting for situations in which glucose is present at high or low concentrations. The main pathway involves the repressor protein, Mig1 (Figure 217). This is a DNA-binding protein, produced when glucose is present. In the presence of glucose, Mig1 is localized in the nucleus, where it (in conjunction with accessory proteins) binds to promoter regions, blocking transcription of the downstream genes. 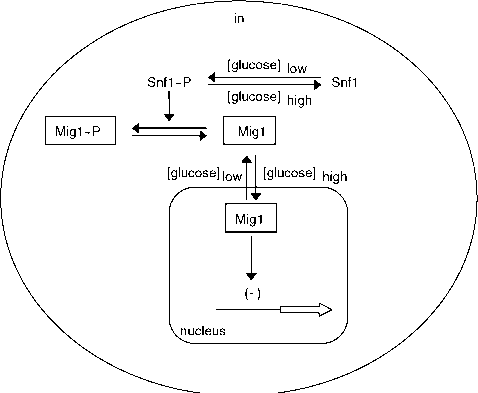 When glucose is absent, however, Mig1 becomes phosphorylated by Snf1, a protein kinase, and is translocated out of the nucleus, resulting in de-repression of the regulated genes (i.e.,those genes are then expressed). A second protein cascade pathway is also involved in glucose induction. In this system, the membrane proteins Snf3 and Rgt2 sense the presence and level of glucose and then generate a signal that either activates or inactivates specific glucose transporters (whose activities depend on the glucose concentration). Like many bacteria, lactic acid bacteria are unable to assimilate inorganic nitrogen and instead must rely on preformed amino acids to satisfy their amino acid requirements. Since most foods contain only a small pool of free amino acids, this means that lactic acid bacteria must first be able to degrade proteins and large peptides and then also be able to transport the free amino acids and small peptides released during proteolysis. The proteolytic system in lactic acid bacteria, especially those species involved in dairy fermentations, has been well studied. For these bacteria, the milk protein casein serves as the primary substrate. Casein metabolism by lactic acid bacteria not only is important nutritionally for the organisms, but its degradation during cheese manufacture has major implications for flavor and texture development (Chapter 5). However, in vegetable, bread, and other fermentations, protein metabolism is somewhat less important. The casein utilization system in lactic acid bacteria involves three main steps. First, casein is hydrolyzed by proteinases to form peptides. Next, the peptides are transported into cells via peptide transport systems. Finally, the pep-tides are hydrolyzed by intracellular peptidases to form free amino acids (Figure 2-18). Each of these steps are described below. Hydrolysis of casein by lactic acid bacteria occurs via a cell envelope-associated serine pro-teinase called PrtP.This enzyme is actually synthesized as a large inactive pre-pro-proteinase (>200 kDa). The "pre" portion contains a leader sequence, whose function is to direct the protein across the cytoplasmic membrane. The "pro" sequence presumably stabilizes the protein during its synthesis.After both of these regions are removed, the now mature pro-teinase remains anchored to the cell envelope. With casein as a substrate, more than 100 products are formed by PrtP. The majority are large oligopeptides (up to thirty amino acid residues), but most are between four and ten residues. Figure 2-17. Catabolite repression in Saccharomyces. The key regulatory protein is Mig1, whose presence in the nucleus or the cytoplasm depends on the glucose concentration. When glucose is low, Snf1~P phosphorylates Mig1, trapping it in the cytoplasm, where it is inactive as a repressor, allowing expression of catabolic genes. In the presence of glucose, Mig1 is not phosphorylated and remains in the nucleus, where it is able to repress catabolic gene expression. their amino acid requirements. The Opp system transports about ten to fourteen different peptides of varying size (between four and eleven amino acid residues). In contrast to dtpT and dtpP mutants, strains unable to express genes coding for the Opp system do not grow in milk. In the final step of protein metabolism, the peptides accumulated in the cytoplasm by the Opp system are hydrolyzed by intracellular peptidases. There are more than twenty differ ent peptidases produced by lactococci and lac-tobacilli that ultimately generate the pool of amino acids necessary for biosynthesis and cell growth. Included are endopeptidases (that cleave internal peptide bonds) and exopepti-dases (that cleave at terminal peptide bonds). The latter group consist entirely of aminopep-tidases, as carboxypeptidases in lactic acid bacteria have not been reported (although car-boxypeptidases may be present). For lactic acid bacteria to fully use peptides accumulated by the Opp system requires the combined action of endopeptidases, aminopeptidases, di-peptidases, and tripeptidases.